Spring is in the air and long before I could feel warmer temperatures, my fingers were itching to hook up brighter yarns. 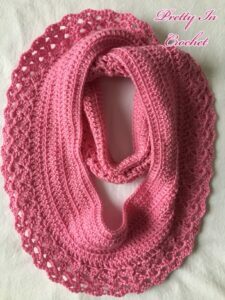 I also got a sudden surge of inspiration and was crocheting up a storm, and so I have several new pieces to share with you. You’ll see them all soon! 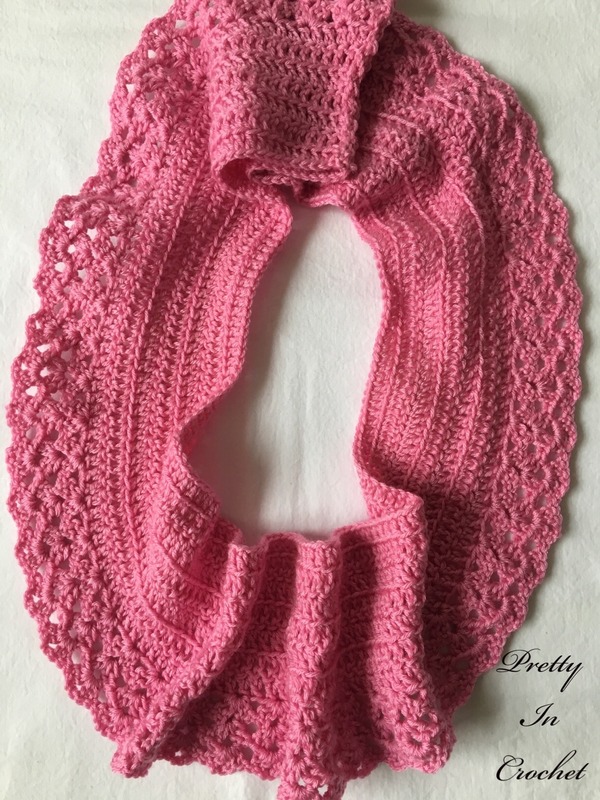 Today, I’m bringing a vision in pink, the Lacy Bloom Cowl, which I think looks stunning. Pair it with jeans and a white tee and you have a classy spring ensemble. Or, throw it under a tan jacket and slacks and you have something more chic and hip. It is reminiscent of the flowers soon to bloom and chases away the greyness of the end of winter. 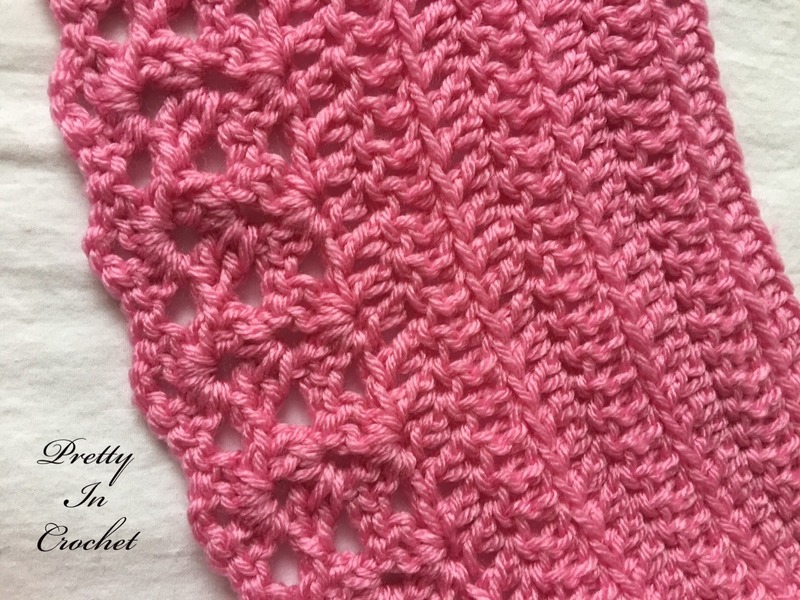 This pattern uses a double knit weight yarn, requires only one skein and the stitches are easy. 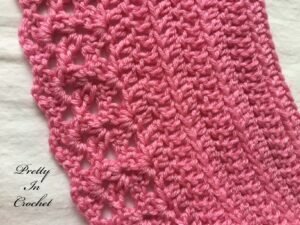 An elegant affect is created by working in the front loops and with the simple shell stitches to create the lace like edging. I hope you love this piece as much as I do. Creating this pattern made me stretch my wings as a designer, marrying simplicity with elegant style. I feel as though I’ve bloomed through this creation. Just in time for spring, I can’t wait to wear this around the town. I do want to take a moment to take a moment to tell you about some upcoming projects. I have been working on a larger piece, and originally wanted to share the pattern with you. But, although the project is working up very nicely and it’s one I love, I have decided instead to provide you with tips on creating your own pieces. Crochet is easy and flexible and although patterns both easy and advanced are wonderful to have, I also believe that an experienced crocheter can hook up their own larger pieces with a little bit of know how. It’s been fun for me in these recent months to try my hand at different types of projects and pieces, and I I hope you enjoy the series I have planned for you. Gauge is not very important for this project. I’m delighted I am sharing this pattern with you today, and I do hope you love it as much as I do. 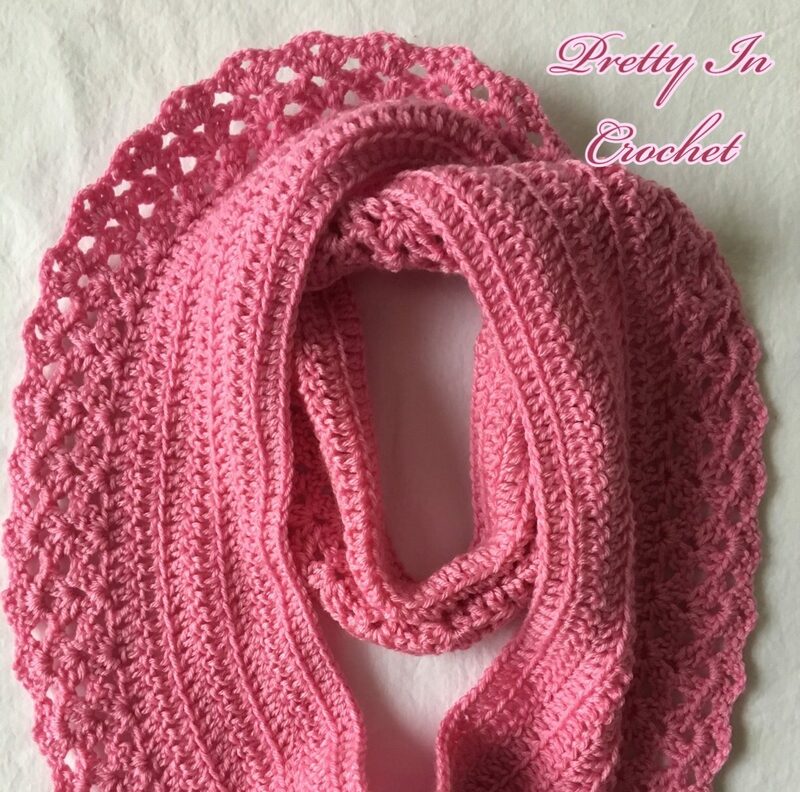 It seems every pattern I create is more beautiful (to me) than the one before, and as I journey through the world of yarn craft and crochet, I am drawn further and further along the path of creativity and I know that with this craft, you can be too. It’s self expression in a quiet way, but I think you will find how much it speaks to you about the very essence of you, and that has been truly surprising and inspirational for me as I am becoming more liberated in life and in this wonderful craft.